Bought a clean Soligor because it was cheap. With the new Nikon/Canon/Panasonic mirrorless, manual lenses will probably become more and more expensive so I'll try to get my "ideal" collection now. I have a 28mm f/2 Vivitar Komine version, and it is not the same as the Kiron version. Well, I read the Soligor might be a bit like the Mir24, let's see. The problem with Nikkor lens is they may be difficult to find in good shape. I have now four of them and all with clean glass but I had to return 4 or 5 because of fungus, especially the great 105 f/2,5. I may try the Pentax M or the Mir24 M42 version (which seems to be a bit better than the Nikkor one) if I can't find a clean Nikkor. But for the moment, I have to save money. 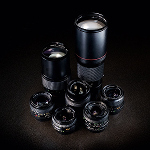 Let us know how your new lens performs! The best third-party 28/2 I tested so far is definitely the Soligor/Tokina, it was clearly sharper and more corrected, expecially wide open, than the Komine, the Vivitar/Tokina and the Kiron (of which there are 2 versions, one with a long focus throw and one with a short focus throw, that is sharper, expecially at the borders of the image). So... maybe you can start a Soligor lineup! I'm surprised the different versions of Minolta 35/1.8 came on top and all perform similarly. I thought the 35/2.8 and the Canons would be better at 5.6.
stevemark , Thanks. I did not expect such performance from 1.8. 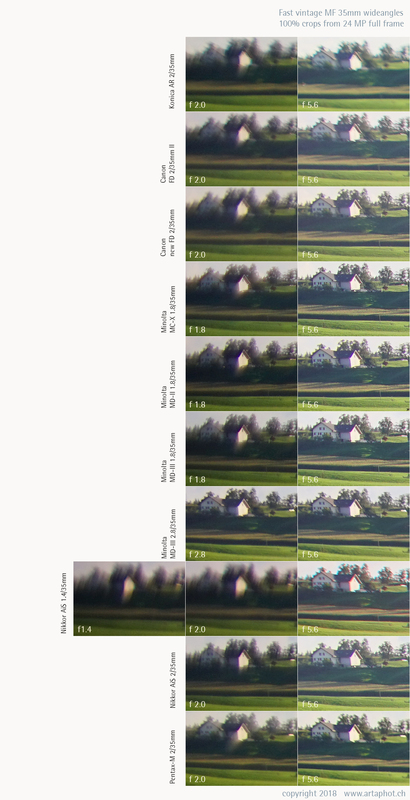 I have compared the Minolta 35mm lenses twice before doing this test (data not published), including many f4, f2.8 and f1.8 siblings (about a dozen) - always with the same outcome regarding the MC-X/MD-II/MD-III 1.8/35mm. Thus i'm quite confident about the result. Minolta project information says that the original MC 1.8/35mm was based on the construction of a Schneider 2.8/35mm lens from the early 1960s. In fact, the lens sections of these two lenses (Schneider 2.8/35mm and Minolta MC 1.8/35mm) are quite similar. I assume that the calculation of the new, much smaller 1.8/35mm was done in a way to keep the performance data of the original MC 1.8/35mm, but to drastically reduce the volume and the weight of the lens. The basic construction of the MD 1.8/35mm, though, remains very similar to the MC 1.8/35mm.